Original Manuscript Cheque, drawn on the bank Clayton & Morris, opening “Mr. Morris, pray pay the bearer …” £50 to Sir Robert Stone for Nicholas Vanacker, the merchant who has signed the cheque. 6 x 8 inches, light border where formerly mounted or framed, folds, in excellent condition, docketed, Clayton MSS stamp on verso. London, 10 March 1659 . One of the earliest cheques in existence, maybe the third oldest known Clayton & Morris scrivener’s cheque. In those years the calendar year began on Lady Day (25 March), so this cheque was issued on 10 March 1660. The first cheque was issued in London on 22 April 1659. It was for £10 and made payable to the bearer by Nicholas Vanacker. It was drawn on the bank of Clayton & Morris. 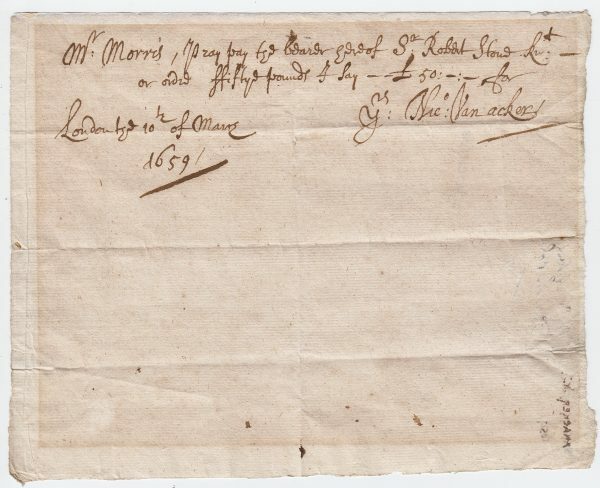 The original cheque was sold for £1,300 at Sotheby’s, London in 1976.The other known early cheques are dated 16 February 1659/60 (in the collection of the Royal Bank Of Scotland) and 27 August 1660; and the earliest held by the Bank of England is dated 8 December 1660. All of these were also drawn by Vanacker on his account with Clayton & Morris. They were the leading bankers of the Restoration, with offices at Cornhill in the City of London: ‘Unlike their contemporary goldsmith–bankers, Clayton and Morris never invested in royal moneylending, nor did they traffic in foreign exchange. Instead, their business was centred in the private market of lending money to landowners. As civil wars and interregnum disrupted credit in the countryside, many landowners, including royalists in search of money to pay compounding fees, turned to London for loans. After 1660 the money market remained centred in the capital, and Clayton and Morris seized the opportunity to dominate it. Their unique contribution to banking history was to integrate the mortgage as a form of long-term security for banking loans’ (Frank Melton, ‘Robert Clayton’, ODNB).